Fitbit seems to be preparing the launch of a new smart wearable that is supposedly going to debut at IFA 2018 as the Fitbit Charge 3. The leaked images reveal a few interesting details, such as the replacement of the physical button with a touch area that could bring in the tap actions currently available for the Alta and Alta HR. Fitbit launched the Charge 2 back in 2016 at IFA and the time for a successor is almost here. After all, this year's edition of the popular tech show located in Berlin is less than a month away now, so the first images of the wearable that could launch soon as the Fitbit Charge 3 surfaced online in the perfect moment. 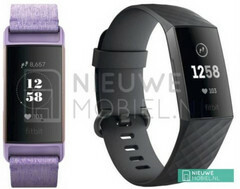 Although a built-in GPS would be an excellent addition to the new Fitbit wearable, the exclusive report by Nieuwemobiel cannot confirm its presence. However, the two images they leaked make it clear that the side button has been removed and its place has been apparently taken by a touch surface. The list of straps seems to be quite generous, including fabric, perforated white plastic (similar to that of the Apple Watch Nike+ edition), black/dust silicone, and — most likely — more that have not been spotted yet. Although the wearable market is still struggling, the Fitbit Charge 3 might turn out to be an interesting addition to this sector currently flooded by affordable Chinese products that are often low-priced but sometimes not of low quality. After all, Xiaomi is not making wearables just for the fun of it.